On the infamous road to Chita I had met a few people riding the other way, mostly Europeans who were almost at the end of their journey. There were usually big waves and a few of them pulled over and we had a chat. One such couple were a Swiss/German pair riding a KTM Adventure. We had the usual bad road conversation and they gave me a business card for a place to stay (called Oasis Guesthouse) in Ulan Baatar, Mongolia (known as UB from now on, too much typing). They mentioned that the pair that ran it were Austrian/German, rode motorbikes and assured me that I would be able get a tyre in UB with their help. It all sounded very good so I shot off from the Russian/Mongolian border in hope of a new tyre and a decent rest without the usual concerns of will my bike get stolen, this place doesn't feel all that safe, I wish those dogs would shutup so I could sleep and was that sound a bear etc. etc. The road to UB is excellent in comparison to what I've seen so far, varying from dead straight to a few twisties through the hill's it was a great ride and pretty relaxed. Sensational scenery, Mongolia really is an amazing looking country. Arrived in UB and lane split through the mad traffic, following the GPS coordinents that the Oasis Guesthouse had so smartly put onto their business card to arrive at the guest house around 3pm. The GPS just paid for itself, I take back all the bad things I said about such devices. I walked out of my Ger after my Nana nap to see a campervan type thing parked next to my bike and thought I'd go and have a look. Always checking number plates first on vehicles became a habit in western Europe so I could greet the owners in their native lingo and start off on the right foot with my camping neighbours. I almost fell over when I spotted not just an Australian plate on this van, but a Victorian one! 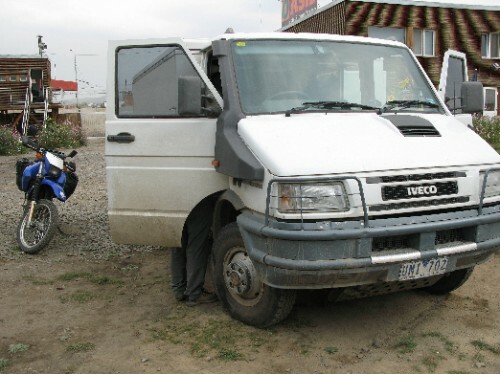 Turned out there were two couples travelling in this beast and they'd just come back from a big tour of the Gobi and were just completing a few repairs. The group had been out chasing parts most of that day. The couple that owned said machine turned out to live about 15km away from where I had resided in Melbourne, of course! They all invited me to come out to dinner with them to what was claimed to be "UB's only Indian/Mexican resturant". I reckon they should claim to be the world's only! I mentioned I was a mechanic which went down very well and gave them a hand with a couple of things on their transportaion device. Very nice people and real adventurer's I reckon, they also had no plans of what they would do after Moscow, just that they would go towards Switzerland. Alway's nice to meet some like-minded traveller's.